This is Randy's pretty amazing solar powered garden helper machine. 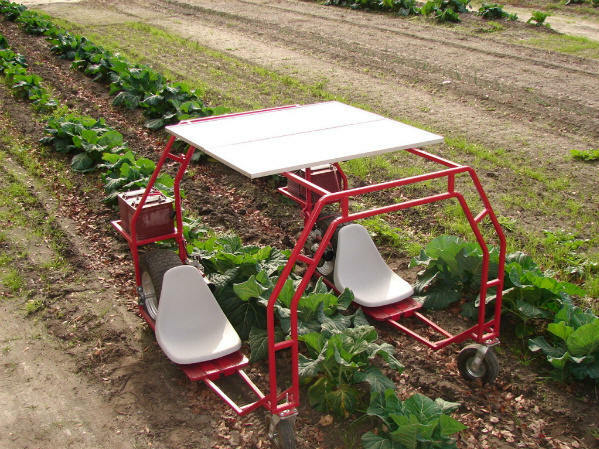 Randy made the machine to make it easier to do the planting, weeding and picking chores in the garden. The seats on each side are adjustable side to side to accommodate wide or narrow rows of plants. The speed control is a joystick that can be mounted left, right or center. The frame is made from 1 inch welded steel tubing. 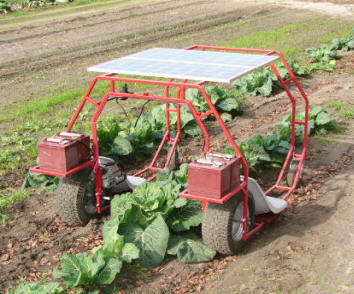 It is solar powered using 4 golf cart batteries and two on board 80 watt PV panels that also provide shade for the driver. The drive train is from an electric wheelchair, but is geared down for more torque. Maximum speed is about walking speed. Thanks very much to Randy for making this available! less weight on front wheels for easier steering.